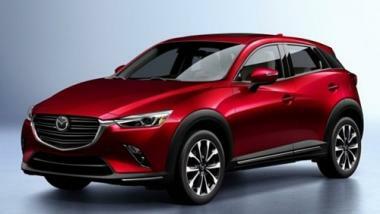 Mazda Motor Corporation has begun accepting pre-orders for the updated Mazda CX-3 at dealerships throughout Japan. An ideal crossover SUV for singles or young couples, the CX-3 has received a major update and a special edition named Exclusive Mods that features deep red Nappa leather upholstery has been added to the lineup. Working to a theme of "Exquisite & Edgy," the team made improvements in design, engines, handling and safety. As a result, the new model offers superior environmental and safety performance and driving performance that engenders a sense of unity for all on board in common driving situations. The redesigned model adopts parts of Mazda's next-generation SKYACTIV-Vehicle Architecture2 to retain the CX-3's excellent handling as a compact car while offering comfortable driving around town and on longer drives. Design improvements, including changes to the front grille, LED rear combination lamps and aluminum wheels, are aimed at creating the feeling of a higher-class vehicle. Inside, the center console has been redesigned and the addition of an electric parking brake, center armrest and multi-box enhance comfort and reduce fatigue. In terms of safety, the refreshed CX-3 is the first model to adopt an updated version of Advanced Smart City Brake Support (Advanced SCBS) with enhanced ability to detect pedestrians at night. This and other safety features, such as Mazda Radar Cruise Control (MRCC)4 with Stop & Go,5 a 360° View Monitor,6 and an auto-dimming rearview mirror help the driver recognize potential dangers both day and night. Newly developed 18-inch tires with a softer vertical spring and optimized rubber and tread combine with the more responsive suspension to smoothly absorb any impact from the road surface. Ride comfort is enhanced by greatly reducing the impact and resulting oscillations of passing over a joint in the road. A quieter cabin has been achieved by increasing the thickness of front- and rear door outer panels, making the rear-door window glass as thick as that of the front-door (4 mm), improving the door seals and the sound-absorbing properties of the headliner. The previous 1.5-liter diesel engine has been replaced by a newly developed SKYACTIV-D 1.8-liter diesel engine to improve real-world fuel economy and emissions performance. With ultra-high-response multi-hole injectors and a variable-geometry turbocharger, it produces strong torque at higher rpms for smooth and powerful acceleration. The radical yet refined beauty of the CX-3 has been further enhanced under the theme of "Exquisite & Edgy." For the exterior, enhancements were made to the grille, the LED combination lamps and the aluminum wheels. Fog lamp bezels and pillar garnishes in gloss black and chrome side garnish moldings give the impression of a higher class vehicle. The refreshed CX-3 is the first model to adopt an updated version of Advanced Smart City Brake Support (Advanced SCBS) with enhanced ability to detect pedestrians in the dark. With the same lineup of advanced safety technologies as Mazda's high-end models, the CX-3 supports safe driving both day and night. With Stop & Go functionality, Mazda Radar Cruise Control (MRCC) can now bring the vehicle to a complete stop, allowing the driver to relax and enjoy the drive. Combining a premium feel with urban chic, the Exclusive Mods special edition is the new flagship of the CX-3 lineup. Specially selected materials and colors create an edgy and modern look.